My first project had me hooked - a Celtic knotwork pillow, appliquéd on a simple background. I loved how quickly this pillowcase came together. It was the beginning of a beautiful fabric collection. 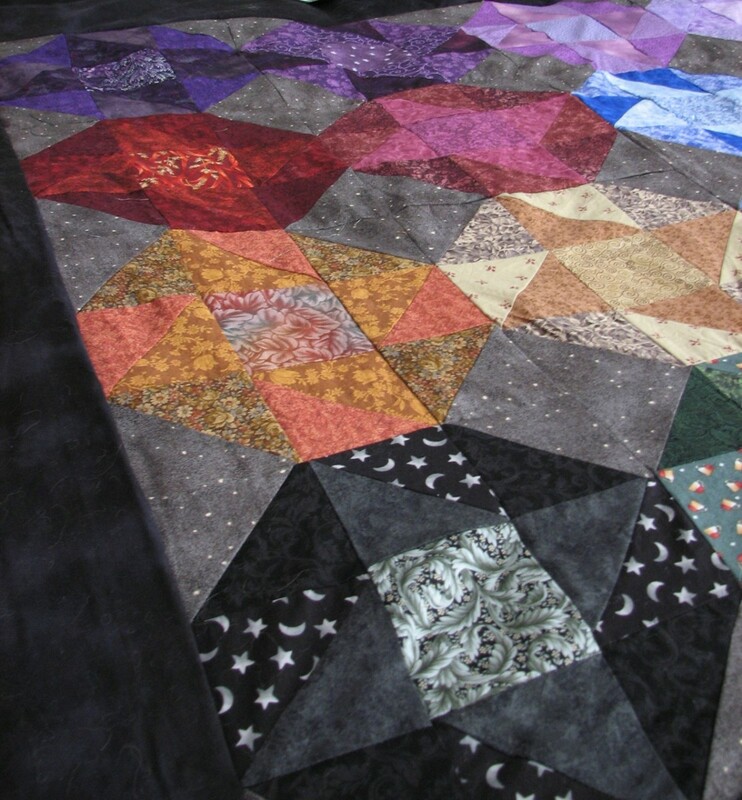 A dark, jewel-toned rainbow quilt was always at the back of my mind. Many of my friends had complex quilting projects lying in their cupboards, put aside because they were too fiddly to line up and sew evenly, so I was a little scared. Managing to ignore my perfectionist streak, giving in to impatience - I wanted my 'usable' quilt quickly - I took the plunge. I didn't want to display it on the wall, I wanted a warm quilt that I would use and love. Are you someone who can't walk past the patchwork section of a fabric store without thinking how perfect a handful would look in a quilt? I am! Visits to fabric stores, second-hand-stores, and even eBay were hazardous to my wallet, and my shrinking storage capacity. Before I knew it, I had a large plastic storage tub full of beautiful fabric, crying to be used. How big is your fabric collection? What fabric? I have none! A few fat quarters - but I buy fabric typically when I have a design. I could easily make one quilt with my stash. Collection? Hoard! I could keep my family in quilts for the next few generations! 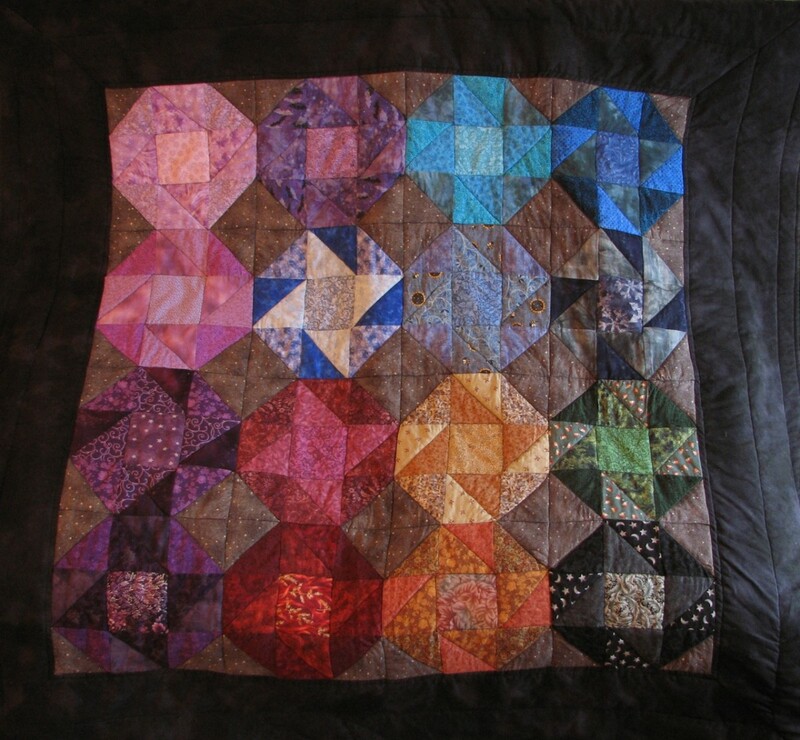 I loved the rainbow color wash designs with hundreds of blended squares running across the quilt. But I am not patient enough to work with small squares. By laying all of my fabric out, I found I could easily make a number of blocks, each with 4-6 shades in a number of colors. 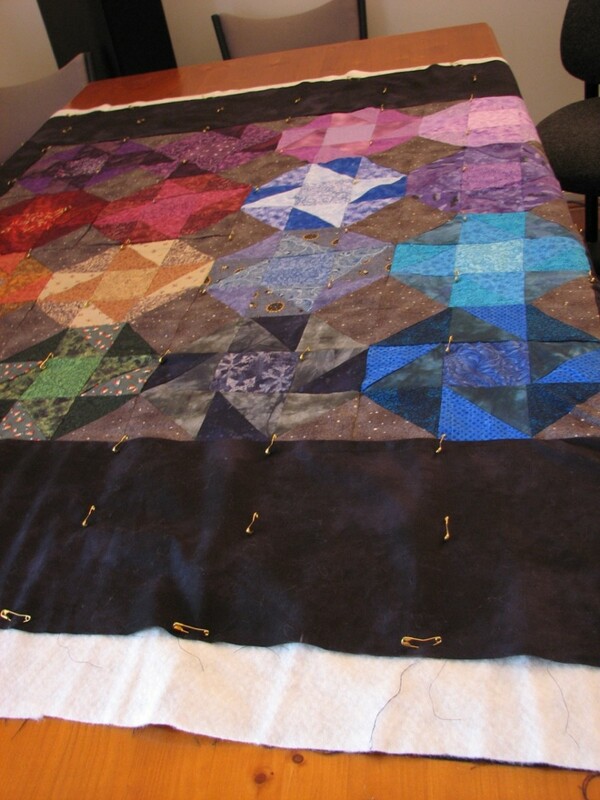 The quilt would be a dark jewel-toned rainbow - exactly what I wanted. Starting with a 3 x 3 square of around 24 cm (each inner block was around 8cm), I designed the block. 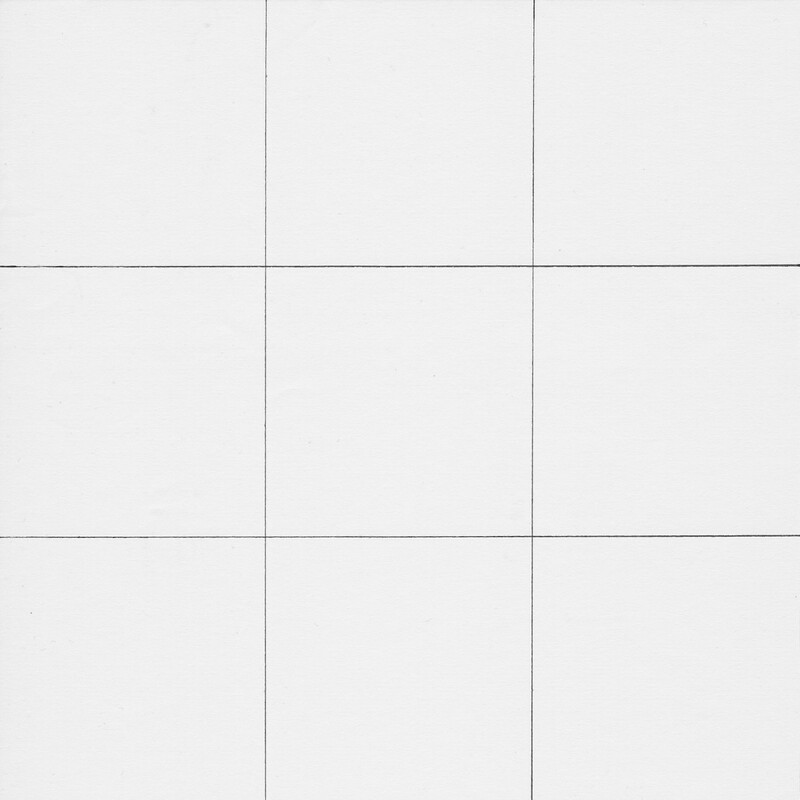 Just squares looked too boring, so I chopped the corners off. 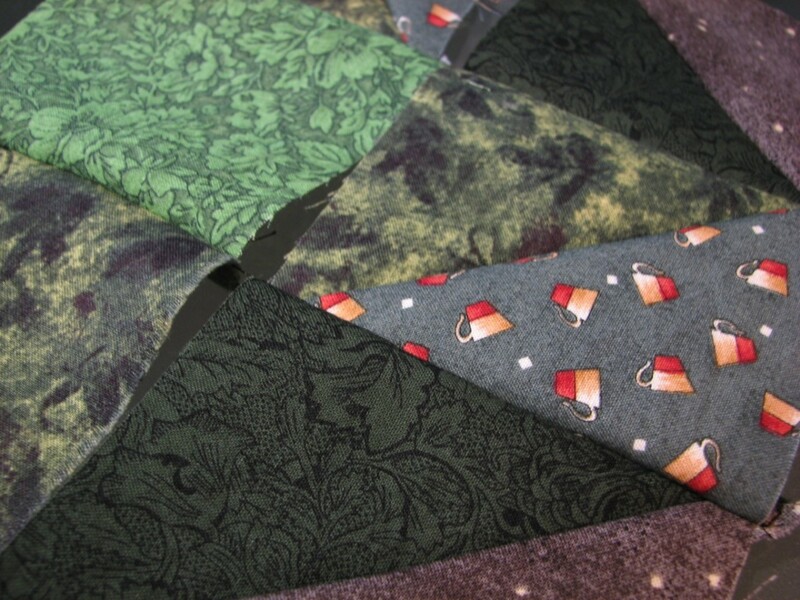 These became my 'blending' triangles - with the neutral fabric that would hold the quilt together. Balancing the angled corners, the middle-edge squares turned into triangles. Playing with the orientation, I searched for something balanced, yet interesting. Color and fabric choice was a little harder, and I resorted to a few test paper blocks before I was satisfied. 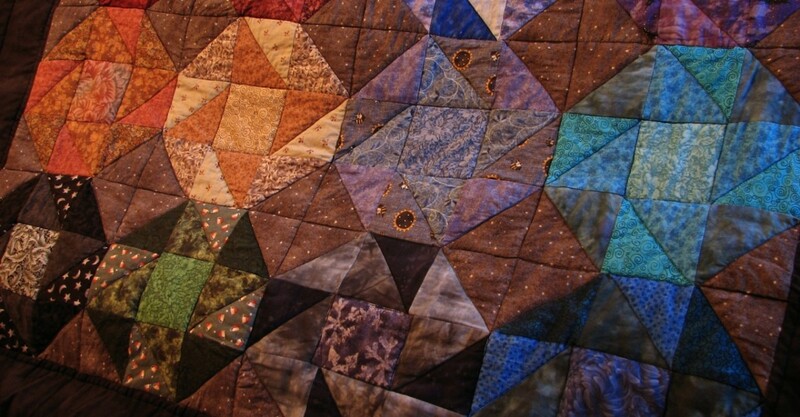 Do you prefer dark, rich colours, or light, bright colors in patchwork quilts? Both - I can't choose! I had decided on a number of purple, blue, red, and green blocks, and one black/grey block. Grey was the perfect choice to balance and blend these blocks together in the chopped corners. Choosing a 'feature fabric' square in the middle of each block, left three other colors, spinning out from the middle square in a pin-wheel-like pattern. I always get anxious before cutting into fabric. What if I screw up? After putting it off for a couple of weeks, I buckled down and did it in one hit. 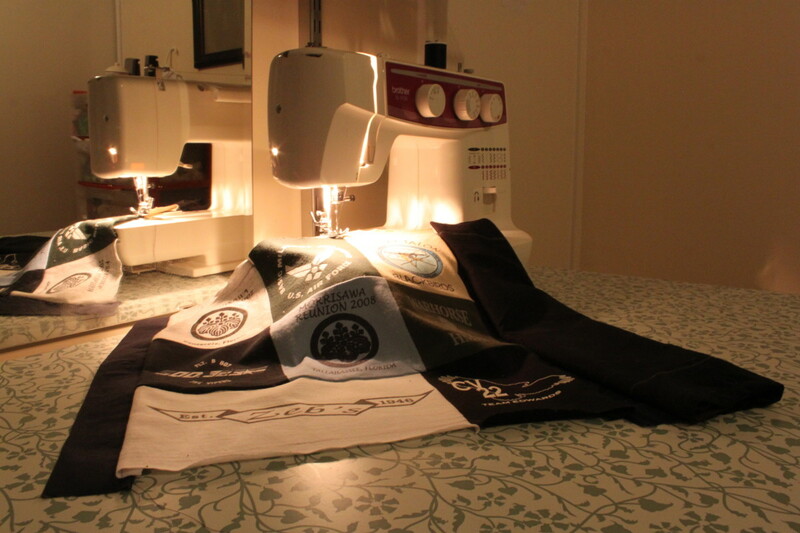 A rotary cutter and self-healing mat really makes cutting fabric a breeze. But you do need a sturdy, large ruler to hold the fabric in place while cutting. Quilting rulers make things easier with their guidelines and perfect angles, but I only had a standard long metal ruler. It was slippery, which meant some of the triangles were a little odd-shaped. Pushing aside my inner perfectionist, I forged on. I'm sure many would chastise me for not using pins - too fiddly and dangerous for my klutzy fingers! Square blocks and triangles meant straight sewing - much easier and faster than trying to follow curves. Starting with the triangular pieces, I chain-sewed each block as much as possible - not stopping to cut the threads until necessary. Next were the rows, and finally then the rows into the finished block. 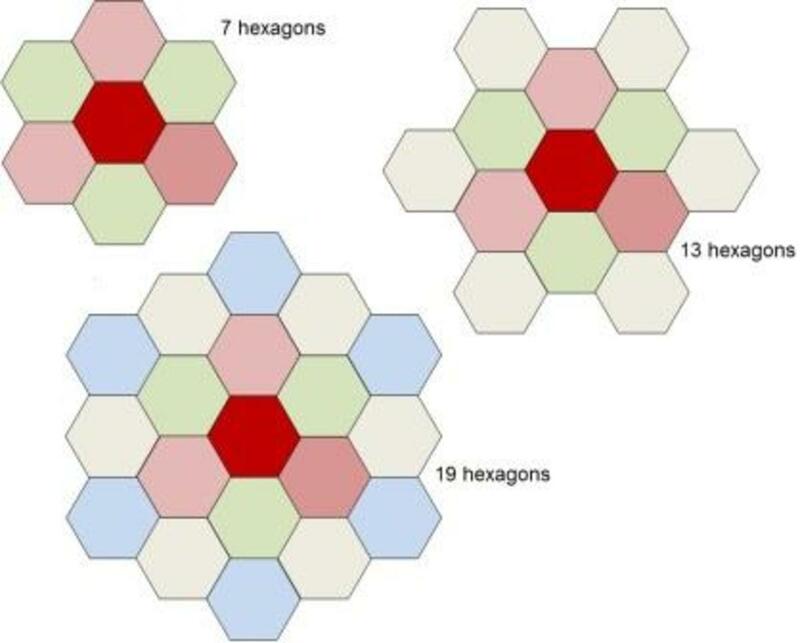 The pieces and blocks didn't completely line up, but that was ok. Without an edge on the quilt, it looked odd, so I added a wide black strip. One day, I might add an appliqué Celtic knotwork design around the edge or some embroidery. 100% wool - heavy, warm, is not easy to wash.
wool/polyester blend - washable with wool wash by hand or on a gentle machine cycle. 100% polyester - not so warm or heavy, easy to wash. Trying to keep the cats away, and not pinning myself into the quilt layers, it was quite a frustrating afternoon! A few practice runs with my walking foot, and I sewed the layers together, carefully and slowly - completely unlike my normal foot-to-the-floor sewing style. I stuck with quilting along the seams, with a couple of stabilizing threads through the thick border. A quick trim to get rid of the excess batting fabric and to make the front and back even, I simply folded the edges over and sewed it together. If I ever get around to doing the Celtic decoration in the border, I'll edge the quilt properly with bias strip. Even without a smooth edge, it's wonderful and warm, even if some of the blocks are a bit crooked. 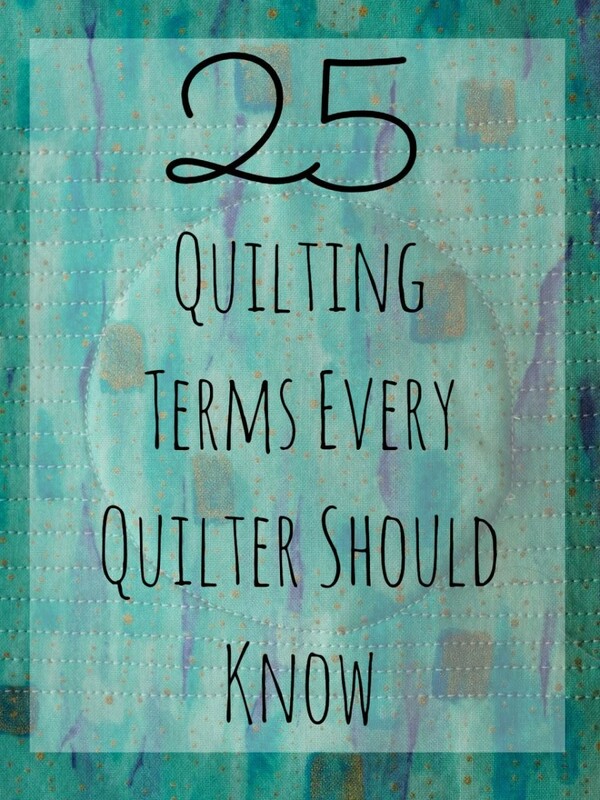 Don't make your first quilt project difficult - stick with something easy and functional. Don't let perfectionism ruin your new hobby! 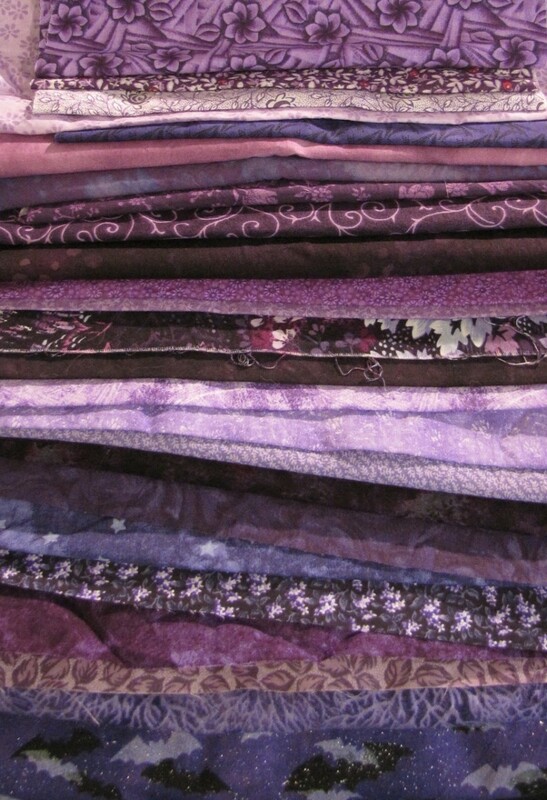 Choose the colors of your quilt. Wash, dry and iron your fabrics. Cut out the block pieces. Sew the quilt's front pieces together. Pin the quilt top, batting and backing material together. Quilt the layers together, moving from the middle to the outer edges. Edge or bind your quilt. One of the most important choices, also affecting block design, is the color combination of fabrics that you want to use in the quilt. 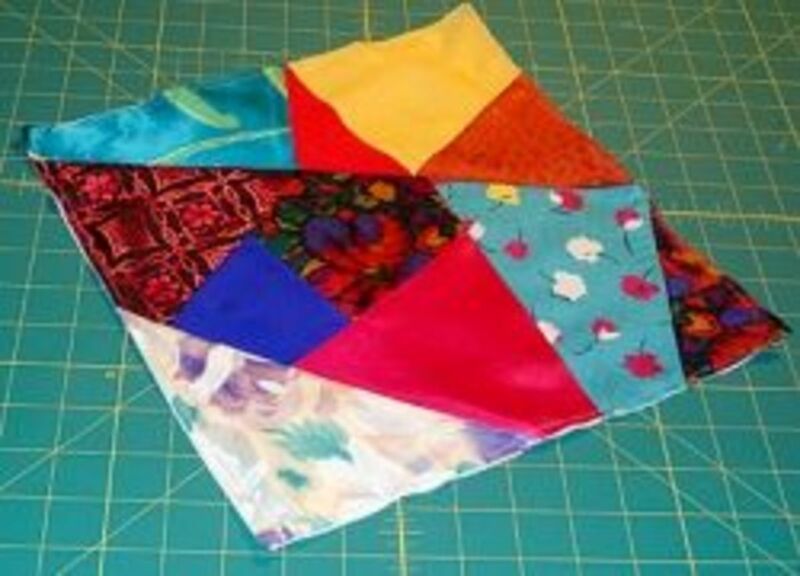 Bright colors work well for kids quilts, in strips or with white blending fabrics. Dark colors work well with black or grey fabrics to hold the design together. Neutral colors and patterns are best if embroidering a design or using appliqué. 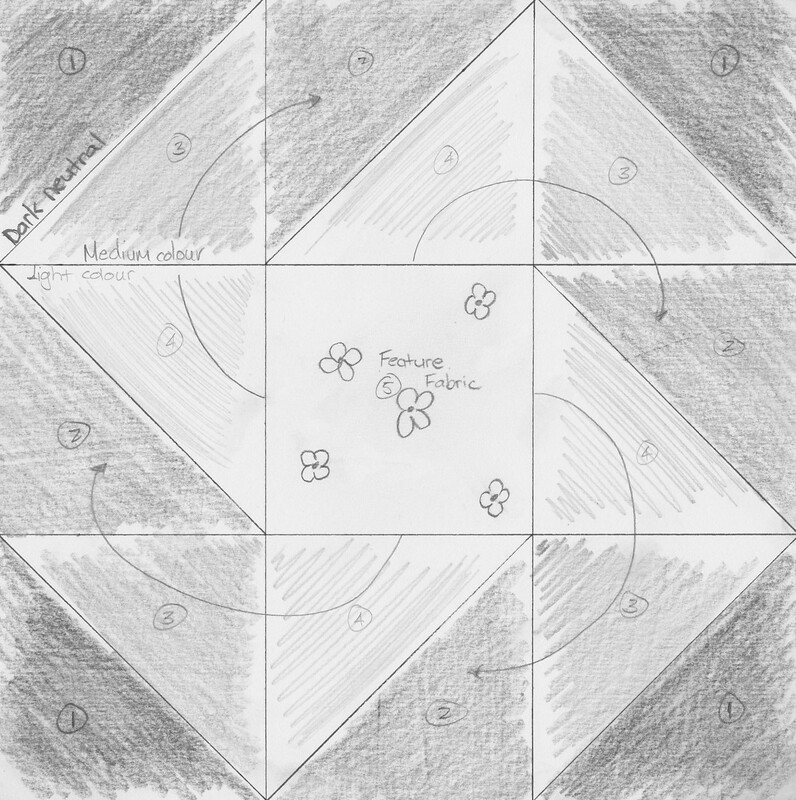 Have you ever designed a quilt block? Yes - please describe it in the comments below! 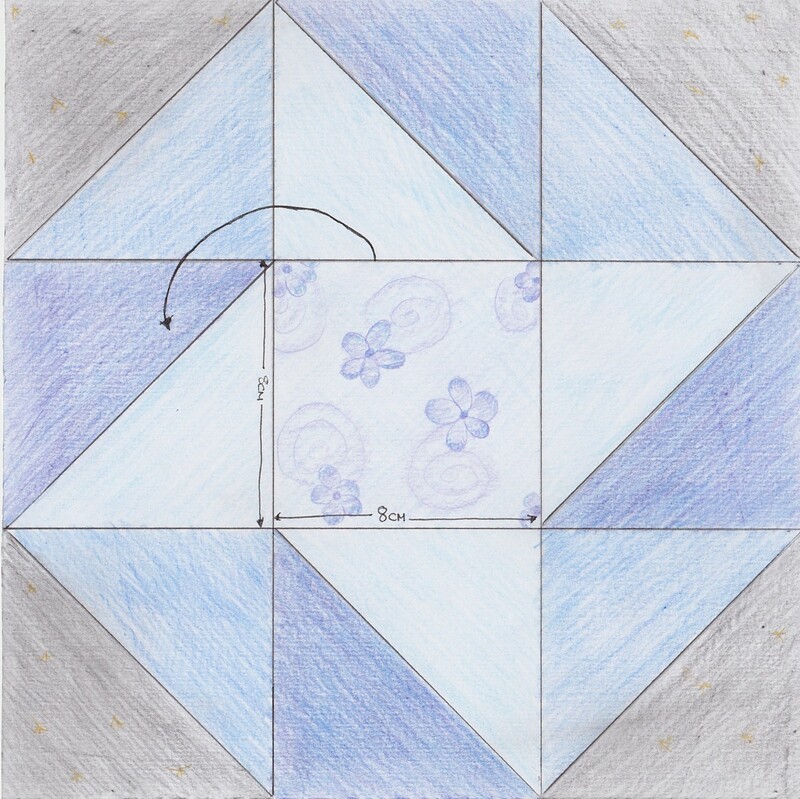 Look through quilt block design sites to learn which blocks you like, and which don't appeal. 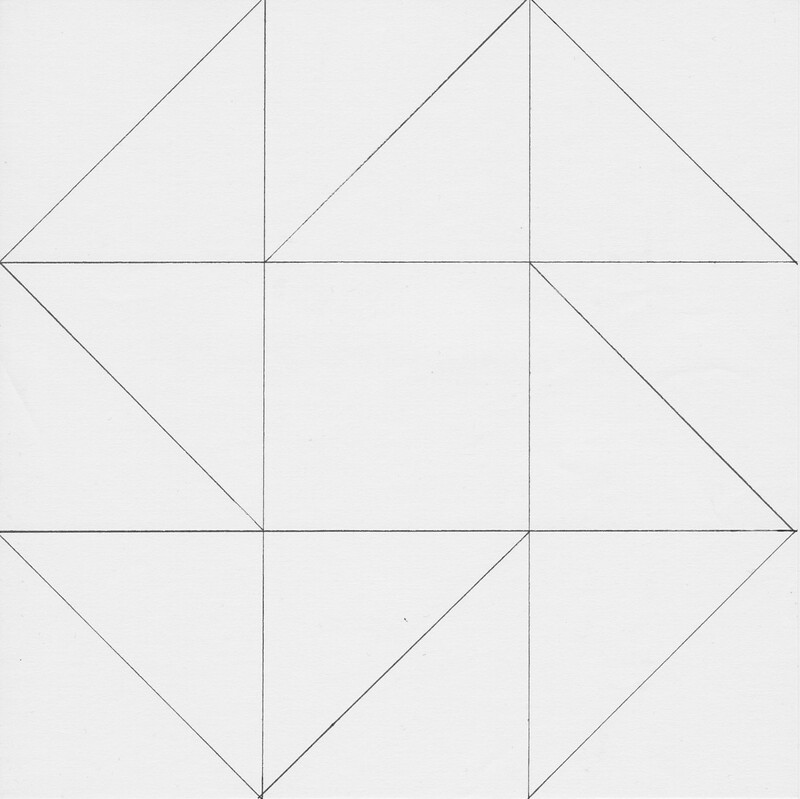 The easiest blocks and pieces to begin with are squares and right triangles (half a square). Draw a few designs on paper. Once you have a layout you enjoy, draw it with a ruler. Color it to see how your fabric choice works, or cut out a quick test block. All fabric should be carefully washed and dried, so you can see if (and how badly) the colors run. This might change your color choice! Red pieces running into a white background will give you a pink quilt - possibly not the result you look for. Wash the fabrics in color batches by hand. Drip dry in a shaded location - sunlight can cause some colors to fade. Iron each piece before you cut it - creases and wrinkles will make the piece crooked. batting for the middle layer. sewing thread, quilting thread (if not using standard sewing thread). scissors or rotary blade, mat and ruler - a proper quilting ruler or angled shape makes cutting fabric to size much easier. standard sewing machine foot, walking foot, quilting foot (if free-style quilting). Cut a template for each piece shape/size from cardboard or quilter's plastic sheets. Include extra space for seams, or note that your resulting quilt will be a little smaller than your design. Cut out your pieces using the template and either a sharp pair of fabric scissors, or a self-healing mat, non-slip ruler and rotary knife. Alternatively, you can use an appropriately shaped quilting ruler instead of a template. 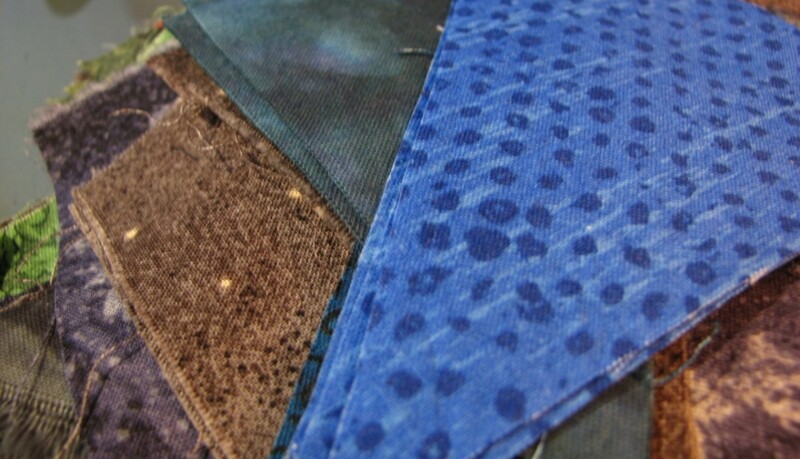 You can sew patchwork pieces together by hand, or using a machine. 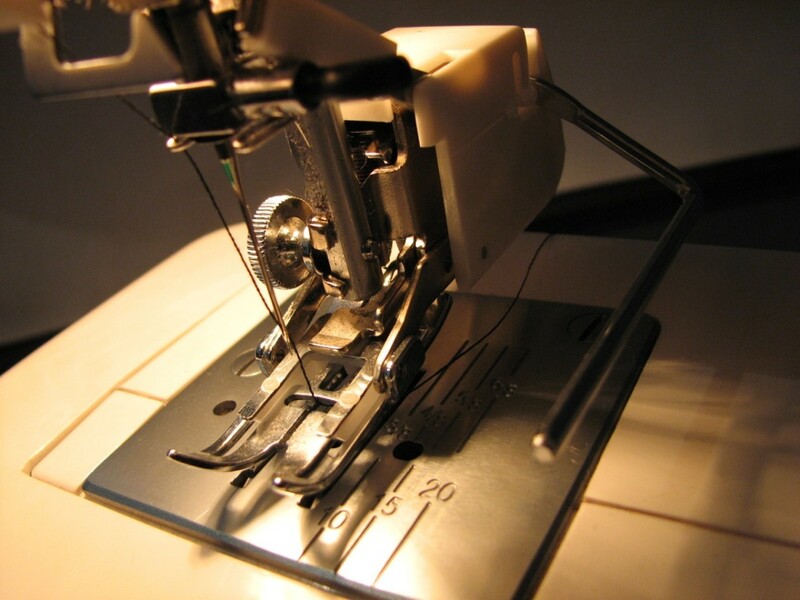 Sewing machine - use a standard sewing thread in an appropriate color, the normal sewing foot for your machine, and a universal needle. 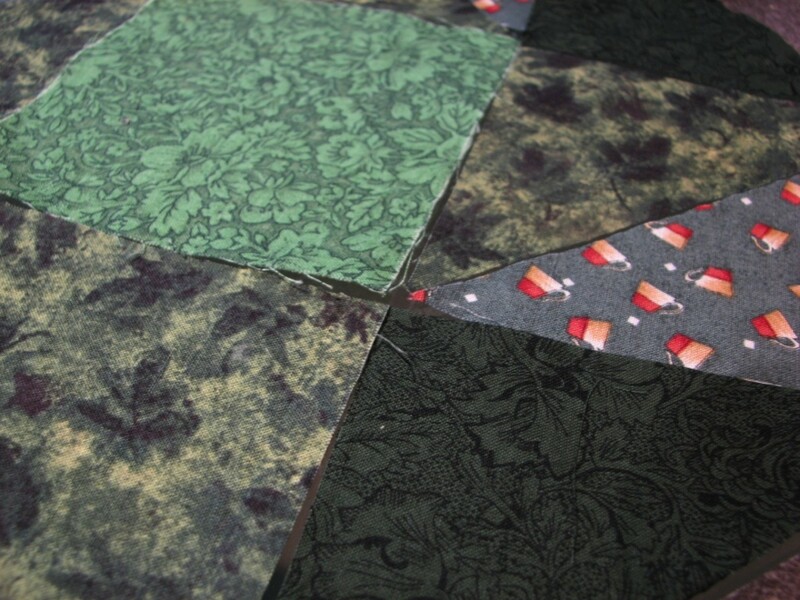 Display your block pattern, and lay out the pieces in their correct positions before sewing. Sew the triangles pieces together to form squares first. If you are using an edging fabric, pin and sew this after all the blocks have been sewn together. Iron the back side of the quilt top to make the seams lie flat. Lay the quilt top, good side down on a flat surface. Place a layer of quilt batting on the back of the quilt top. making sure that it is larger than the quilt. Lay the backing fabric on the batting, and smooth to remove any wrinkles or creases. Use safety pins or specially shaped pins for quilting to pin through the layers of your quilt. Start in the center and pin out to the edges to make sure the layers remain straight and even. You can sew the layers together by hand. A floor embroidery or quilting stand makes it easier to manage. Alternatively, use a walking foot and strong quilting needle on your sewing machine. Quilt from the center out along the seams, removing the pins gradually as you go. Once the top has been quilted in the seams, you can add squiggly fancy quilting using a clear quilting foot on your sewing machine, or by hand. Quilting companies can take your finished top and quilt it onto the backing and batting in fancy patterns if you don't like doing this step yourself. Trim the batting slightly smaller than the edge of the quilt top to prevent lumps in the quilt edge. Trim the backing fabric slightly larger than the top quilt's edge. Fold the backing fabric over the batting. Fold the edge of the top of the quilt under, matching it against the folded backing. Pin and sew the layers together by hand or using the walking foot on a sewing machine. 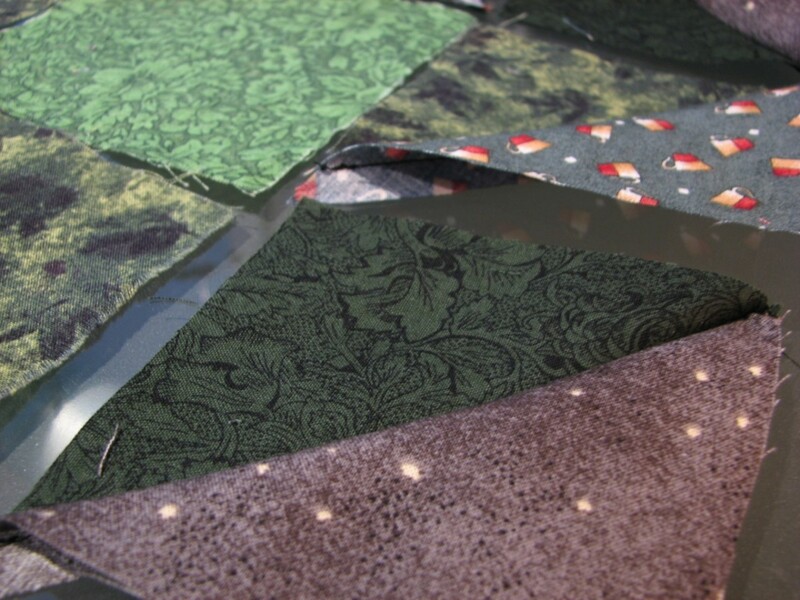 Alternatively, you can buy pre-folded bias strips, or make your own quilt binding, which can be placed over the quilt edge and sewn. 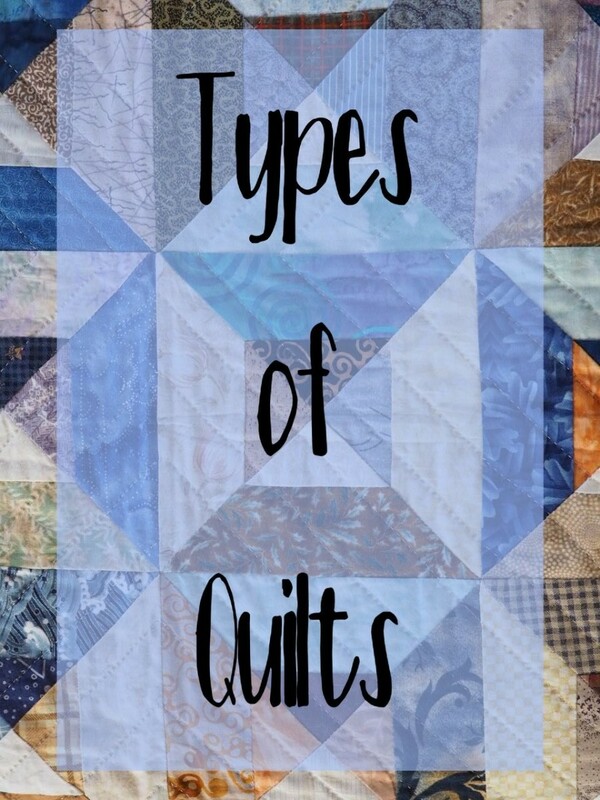 Have you designed or made a quilt (or a few)? Did you use your own block design, or did you use a pattern? 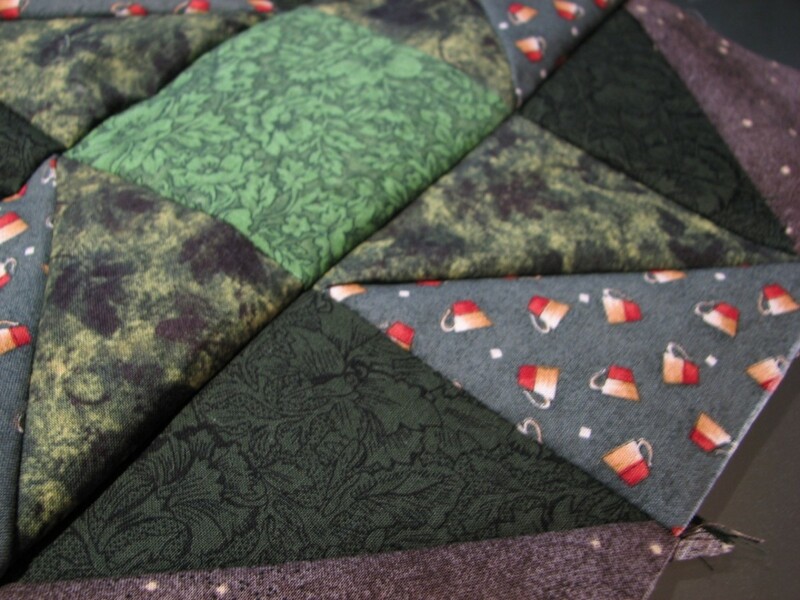 Let us know about your quilting projects, tips, dream quilts and horror stories below! Do you know the name of your block is "Friendship Star Variation". 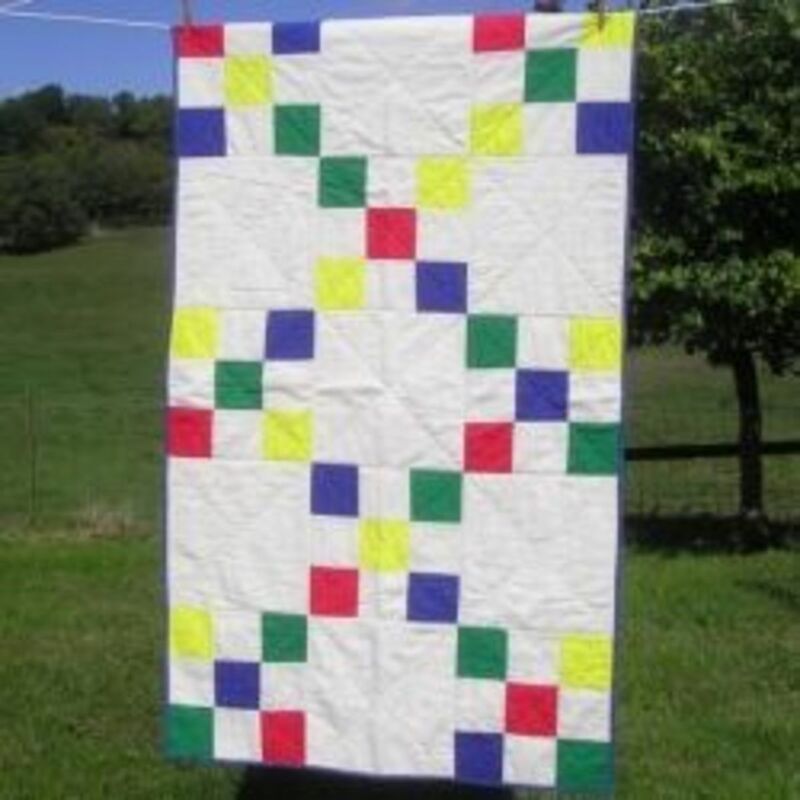 ?It is the basis of a traditional quilt design called The Lattice Quilt. I have designed and made more than 200 quilts from miniatures to king sized, and have only stopped now because of our living circumstances. Thanks for your hub. This is a great hub . . . I don't quilt, but I read quilting patterns to inspire my crochet. This lays out ever step so clearly I'm inspired to try quilting some time. Thanks Kimberly! 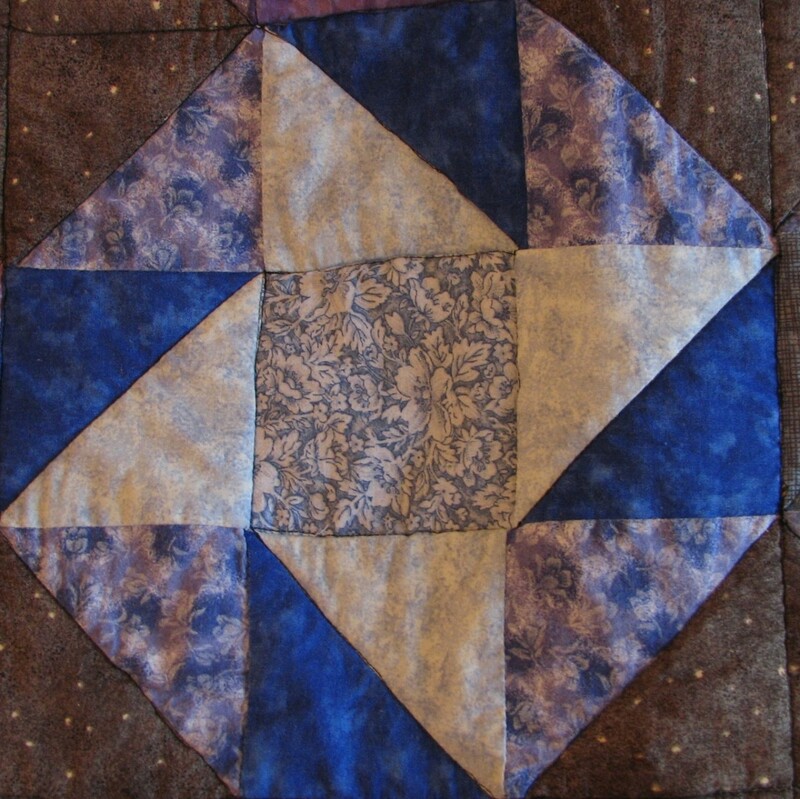 You'd be surprised at the roughness of this quilt (I didn't pin, so nothing really lines up), if you saw it up close. But it looks fine from a metre or so! Your mother-in-law's quilt sounds fabulous - was it made with cotton or more satin-like fabrics? This is beautiful! I have only made one quilt so far and it was not near as pretty. My mother in law made a quilt with different blue fabrics that looked like water was moving. It is gorgeous. I am hoping to do a similar one soon. ChitrangadaSharan - Thank you! Patchwork is a lot of fun - I hope your family enjoys their quilts! Millionaire - Thank you so much! I love deep dark colours, so had a blast creating this combination. The shop didn't have cotton batting - is it very heavy? I suspect this would be a good summer choice - it would breathe more than polyester. Glimmer - Thanks for sharing! 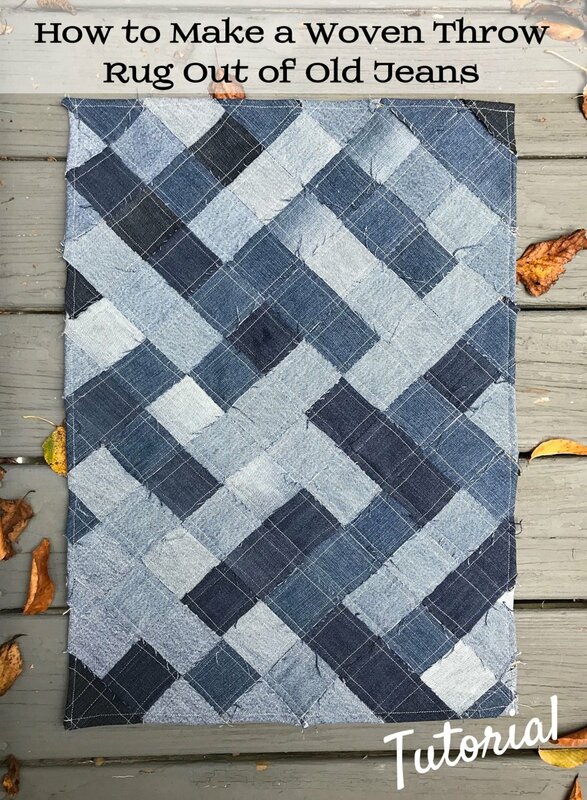 Have you made quilts for yourself, or as presents for family/friends? Great hub! I love designing my own quilts and quilt blocks. Voted up! This is a beautiful quilt - love the rich colors. I have designed my own quilts, especially the small ones, but I tend to buy patterns and change them up to suit my tastes. I don't normally use templates though for squares and triangles. I just rely on my ruler. I either cut the square that makes the triangles 7/8 inch bigger than the size of the square I want it to be, or go up a whole inch and trim it down to the proper size. My favorite batting is cotton - it keeps you warm, but it is easier to sew than polyester, and gives a nice crinkly look to a washed quilt. Nice and creative hub--well written and equally well illustrated. Yes, I have also stitched many quilts for my family and that too with lot of colored pieces of cloth. Each time it was pure fun. Your geometrical patterns are simply beautiful. Thanks for sharing.